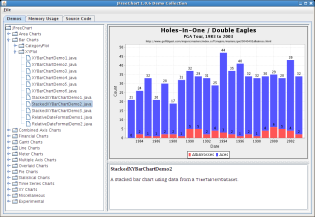 JFreeChart is a free software library for creating charts on Sun's Java platform. The JFreeChart project was started by David Gilbert at the end of 1999 and has been sponsored by Object Refinery Limited ever since. The main project page is hosted at JFree.org. JFreeChart is free software, licensed under the terms of the GNU Lesser General Public Licence. The JFreeChart Developer Guide is sold by Object Refinery Limited to help developers get more value from JFreeChart. Sales of the guide help to finance the project. We appreciate your financial support for our work. By purchasing the JFreeChart Developer Guide, you are contributing to the ongoing improvement and development of JFreeChart. Thanks!